The blogging world recently lost a great blogger and woman. Tina Downey touched so many and will be missed greatly. 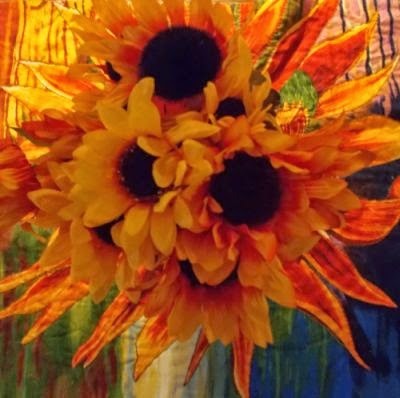 In honor of her life and the beauty she shared, we are covering the Internet with sunflowers, her favorite. For this tribute, participants were asked to buy or plant a sunflower in her name and post a picture of it today.You can even purchase plastic sunflowers! 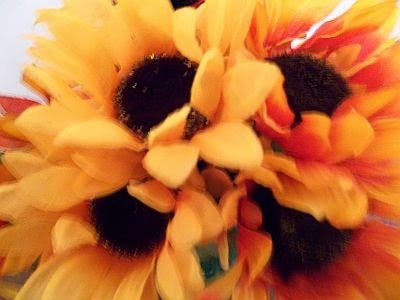 It's the thought that truly counts, and plastic sunflowers will last forever. There's still time to sign up. Even if you can't get to the store to buy a sunflower, you can still share a picture of one. Even if you didn't know Tina personally, you can still contribute to this beautiful tribute. I had to go the fake flower route. The artwork under the flowers actually has a sunflower on it. Can you see the long petals? I'm sorry that the pictures aren't good. My camera was acting up. 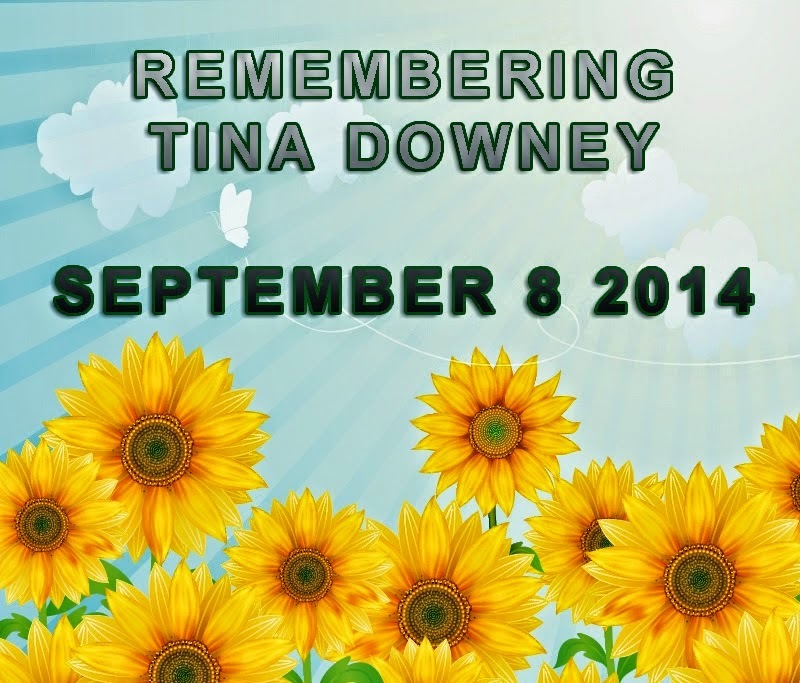 Surrounded by sunflowers...Rest in peace, Tina! Hello Chrys. I'm seeing awesome tributes to Tina. I didn't sign up but I have Van Gogh at the end of my post today. Van Gogh is a perfect way to contribute to Tina's tribute, Denise. Your photos are stunning, Chrys. And I love the quote you used by Helen Mirren. 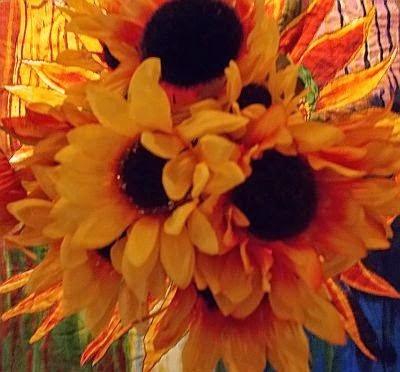 I never really thought about sunflowers before. Your post has really opened my eyes to their beauty and meaning. I didn't know Tina but I've seen her name mentioned countlessly throughout the blogging world since she passed on. She sounds like an incredible woman and you are very kind to be contributing to the longevity of her memory and mark on this world. Tina would really appreciate that, fake or not. Thanks for the great quote. I'm glad you think so, Alex. You're welcome for the quote. Love this, Chrys. And what a wonderful quote! Thanks for sharing it. Thank you, Madeline! I'm happy I heard about the tribute so I could contribute. I went with plastic too, my green thumb is not green... thank you for your wonderful words and thoughts. Plastic is great! I wanted to plant sunflower seeds, but of course they wouldn't have bloomed so quickly. Those are pretty. I had to put together a fake arrangement, too. Sunflowers are so beautiful. This is a wonderful tribute to Tina. Sunflowers are beautiful. They matched Tina's spirit. I'm sorry you've lost a friend and inspiration, Chrys. I wasn't familiar with Tina's blog or work (sorry to say that). The images are beautiful and I love the Helen Mirren quote you've included. Tina would love these pictures. She will certainly be missed! I'm glad you think so, Sherry! She sure will be missed. I didn't know Tina very well, but I like the Helen Mirren quote. 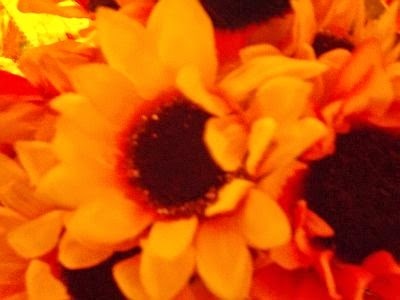 Sunflowers are beautiful flowers, in my opinion more interesting than the clichéd roses. Loved the quote and the pictures. She would be surprised at all the "Fuss" we are going through to give tribute for her today. She'd love the pictures, I'm sure. Great job. I didn't know about this but I actually have sunflowers. What a beautiful tribute to Tina. I love that Helen Mirren quote. I love the quote tribute. Very appropriate for Tina. I'm glad you think so, Susan. I think the blur makes the pics unique. It's so nice to see so many Sunflower around the net. Nice tribute to Tina. Sunflowers are beautiful and I love how they follow the sun. The memorial posts this week were wonderful. All the posts were beautiful. I'm glad I could be a part of it. I think she would be pleased, too. The artwork makes a gorgeous combination with the flowers. Love the quote, as well! I had forgotten that sunflowers track the sun. I had forgotten about that, too!